Probably out of ignorance, many travellers try to hide their meat somewhere in the vehicle in order to get it through a control point. However, if you know why vet fences are in place and the damage foot-and-mouth disease can cause to the country’s entire meat industry, you will realise that these officers aren’t just out to deprive you from your tasty meat. They are purely doing their job; trying to protect the national herd from disease and individual farmers from financial catastrophe. If you are polite and courteous to the officials at these vet check points you will very seldom encounter any problems. The Rooidag veterinary control point in Boesmanland, Namibia. You should respect the laws prevailing in your host country as foot-and-mouth disease can bring the whole meat industry of a region to its knees. As soon as foot-and-mouth disease is detected, all exports are suspended, and that includes shipments to the EU which is a massive market for Namibia and Botswana. Be a responsible visitor and adhere your host country’s regulations. The aim of establishing veterinary fences in the 1960’s was solely to protect cattle against foot-and-mouth disease emanating from buffalo. However, since then the number of diseases which can potentially affect cattle, and now have to be considered as veterinary control issues, have increased. Thus today these fences are aimed at controlling more than just foot-and-mouth disease. Foot-and-mouth disease (FMD) or hoof-and-mouth disease (Aphtae epizooticae) is an infectious and sometimes fatal viral disease that affects cloven-hoofed animals like African buffalo, antelope, impala, springbok, sheep, goats and domestic cattle. The virus is highly variable, which limits the effectiveness of vaccination. It causes a high fever for two or three days, followed by blisters inside the mouth and on the feet that may rupture and cause lameness. Adult animals may suffer weight loss from which they do not recover for several months, as well as swelling in the testicles of mature males. In cows, milk production can decline significantly. Though most animals eventually recover from this disease, it can lead to myocarditis (inflammation of the heart muscle) and death, especially in newborn animals. Some infected animals remain asymptomatic, but they nonetheless carry FMD and can transmit it to others. FMD constitutes a severe plague in animal farming, since it is highly infectious and can be spread by close contact with infected animals. Furthermore, it can be spread over a long distance through contact with contaminated meat and animal products, farming equipment, vehicles, clothing and skin of animal handlers, animal feed, and by non susceptible domestic and wild predators. Its containment demands considerable efforts in vaccination, strict monitoring, export bans for meat and other animal products, quarantine, and occasionally the elimination of millions of animals. Humans can be infected with FMD through contact with infected animals, but this is extremely rare. It was reported that FMD killed two children in England in 1884, supposedly due to infected milk. The disease is not to be confused with hand, foot and mouth disease (HFMD) which is usually caused by a Coxsackie virus and often seen in toddlers. Because foot-and-mouth disease rarely infects humans but spreads rapidly among animals, it is a much greater threat to the agriculture industry than to human health. FMD is not unique to Africa and has been reported in the United States, United Kingdom, Taiwan, China, Japan, Korea and Bulgaria. The northern part of Botswana is infected. 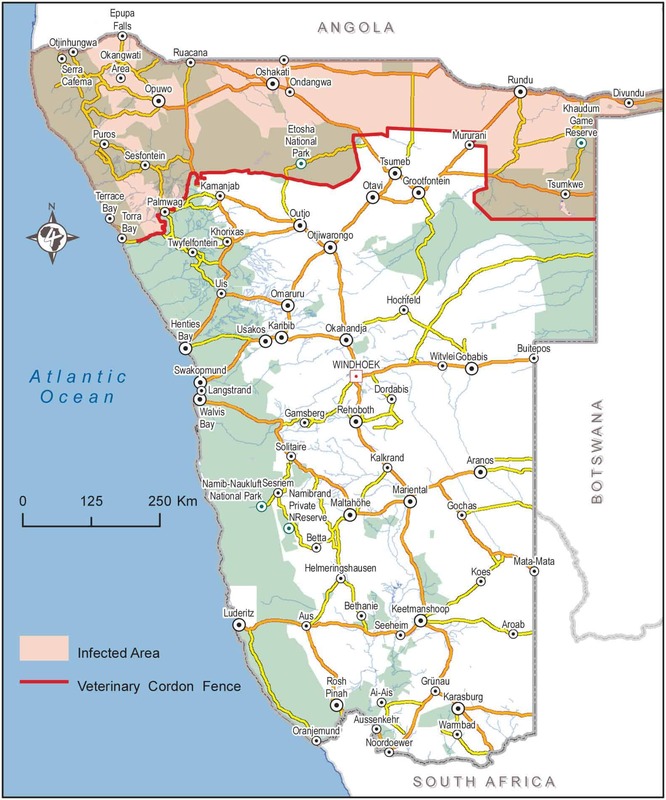 The infected area in the north of Namibia. Veterinary cordon fences are physical fences demarcating control zones in accordance with the guidelines of the International Animal Health Authority. On T4A’s GPS maps these fences are referred to as ‘vet fences’ and are indicated with red lines. Movement of raw meat and animal products, including unpasteurised milk, is allowed into but not out of an area classified as an infected zone. Often visitors feel that their vacuum packed or deep frozen meat poses a minimal disease risk, but the logistics of having every permutation of the rules enumerated in a form that can be understood by the vet fence guards, is impossible. So do not take raw meat in any form past a vet fence checkpoint out of an area classified as an infected zone. The vast majority of veterinary fences and the gates allowing access are static, therefore some checkpoints have been in operation at the same place for years. However, temporary veterinary gates are erected when necessary to contain a FMD outbreak within a smaller area, thus preventing spread through the entire sector. The temporary gates operate similar to police road blocks; sometimes they are in operation, but more often not. It all depends on the disease status in the area at a specific time. At some of these fences you may be asked to drive your vehicle through a dip filled with a disinfecting solution and you and your passengers may also have to exit the vehicle and walk on a mat impregnated with the solution to disinfect your shoes (the ones you are wearing plus extras). Thus it is best to have cool boxes/fridges readily accessible for inspection and all shoes close to hand in a box which prevents the disinfectant from covering other gear. A nothing-to-hide attitude makes life so much easier. 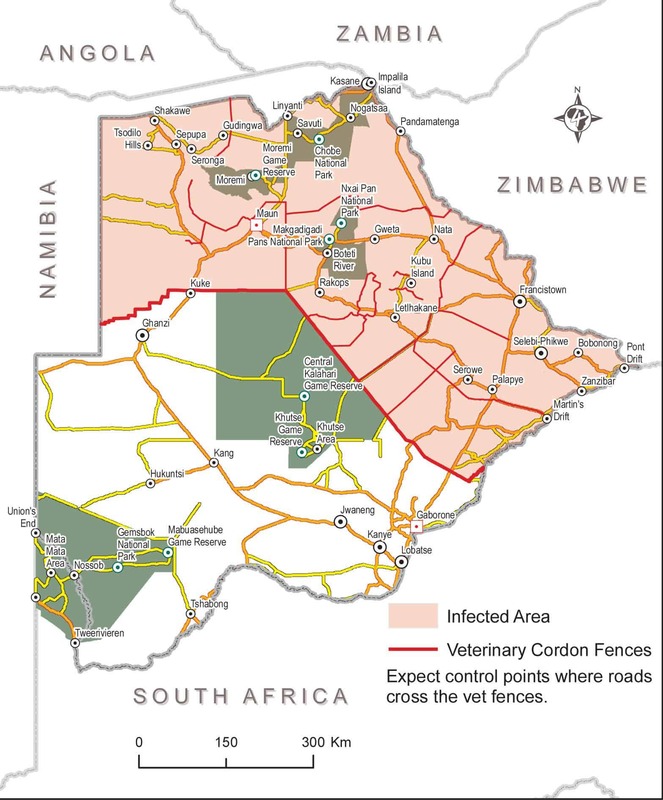 In Namibia and Botswana vet fence restrictions allow you to move meat from south to north and from east to west. However, you cannot move meat from north to south and from west to east past the vet lines as the northern regions are classified as foot-and-mouth infected zones. From the vet fence west between Tsumkwe and the main Rundu/Grootfontein road. Etosha south. You can however take meat into Etosha coming from the south. 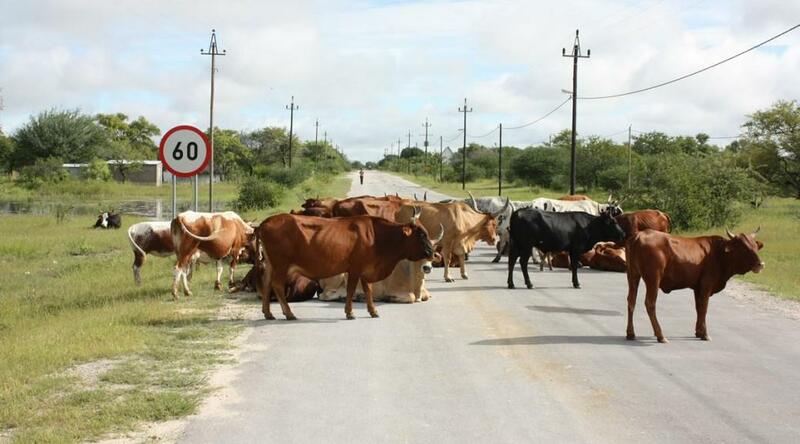 Due to vet fences in Botswana you are not allowed to take meat from Maun to Nxai Pan, Makgadigadi, Nata or Ghanzi. You can, however, take meat from Maun to Tsodillo Hills, Moremi, Chobe and Savuti. You really don’t need to travel with meat past vet fences as good quality meat is available all over Namibia and Botswana. Is it possible to transport raw meat from Windhoek to Katima Mulilo? Hi Lucas, sorry for the late reply. Yes from Windhoek to Katima Mulilo you can take meat as you are going north and not coming from an affected area. Coming back south with raw meat will not be allowed. Please be aware of the fact that if you visited the FMD-area, you should wash your cloth, clean your footware and vehicle before entering a (cattle)farm in a non FMD-area be it in Africa or any other part of the world. Hi.We have just returned from a trip into the Kaokoland Northern Namibia.We took meat up and bought meat and knew all about the vet fences at Palmwag and Kamanjab.So we only had some cooked meat and chicken.BUT the chicken was all confiscated…so in Africa one never knows!! I have tried to find a number to phone and query it. Good morning, will we be able to take meat through the Caprivi from west to east? E.g. Rundu to Katima? Thank you. Lucas, there is a vet control point at Divundu but they check for meat coming out of the Caprivi heading for Rundu. 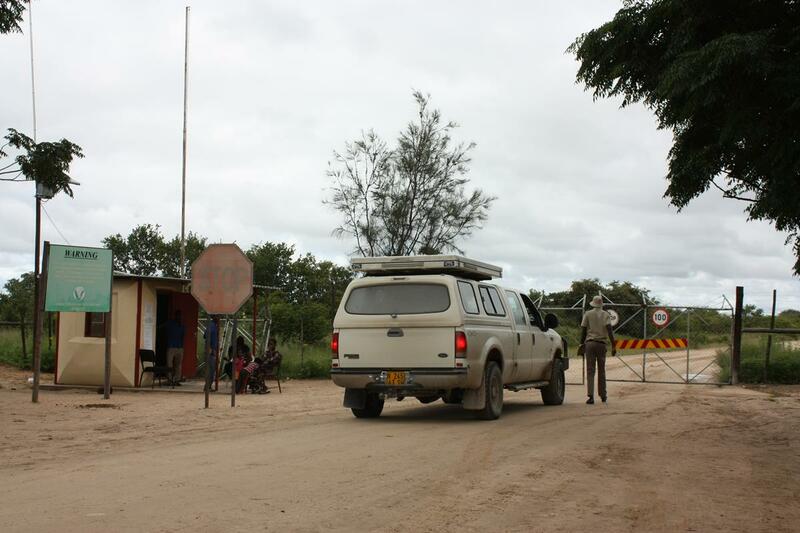 Because the whole northern section of Namibia is declared Foot-and-Mouth area you are not prohibited to take meat from Rundu to Katima. Good morning Karin, hope you are still on the blog. We are traveling van Rakops to the Central Kalahari to Sunday Pan, seems there is a boundary we need to cross. From the Central Kalahari we then go north towards Maun and Tsodilo hill. This I read is not a problem. Concern is Rakops to CK? Hi Jeroen, There is no vet control gate between Rakops and Matswere Gate. There is, however, one between Orapa and Mopipi if you come from the east. Last year we were just waived through without the officer checking anything at this point, but rather be prepared to be checked. Thanks for the information. Our route is from Kharma Rhino to Rakops to CK, so we should be fine. Confirm boundary limits red meat is North to South, West to east. Chicken is fine? If the meat is cooked, then I understood it is fine. Jeroen, you will be passing through two vet control points, one before Letlhakane and one before Mopipi. Cooked meat is fine and normally chicken is also fine, unless there was an outbreak of bird flu.If you like you can check with the Director of Veterinary Services on +267 368 9000/9505. Hi Karin. If I understand correctly you are saying it is NOT ok to transport meat from Khama Rhino sanctuary to Rakops to CKGR as you would be going through 2 vet fences. Where would one then buy meat. At Rakops? We are traveling from Windhoek via Buitepos to Ghanzi/Maun/Khwai/Moremi/Savuti/Chobe to north. We would like to bring our (raw) meat from the farm with us, Gemsbok or Zebra. Zebra can not get FMD, so it should be no problem via the vet fences? Any news about veggies and fruits? Jens, both Gemsbok and Zebra are cloven hoofed animals and the rule says that you are not allowed to take meat of cloven hoofed animals past a vet fence. I think you will battle to convince the vet fence guard that zebra can not get FMD. For the latest on veggies and fruit, I suggest that you phone the Botswana Department of Crop Protection on (+267) 392 8745/6. If you buy meat in Botswana, are you allowed to take it across the vet fence from north to south, e g from Chobe to Moremi? Henriette, you cannot move meat from north to south and from west to east past the vet lines. However, there aren’t any vet fences between Chobe and Moremi, therefore you are allowed to move meat between these two parks. 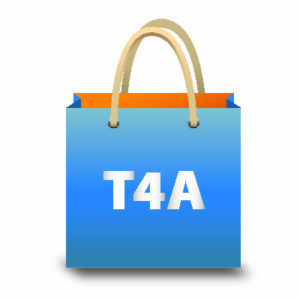 The new T4A Botswana paper map clearly show these vet fences. We are doing a trip in May this year, me from Namibia and b-in-l from Moz. We are meeting in Maun then going to the Central Kalahari , Khutse and then Kgalagadi. There are no places to buy meat after the vet fence at the CK. We will be in the CK for 8 days. How, or where do we buy meat and if so, how to transport it, permit/cooked??? We were hoping to buy meat in Maun for our trip to the CK. We will buy meat in Kang for the rest of the trip, so that leg won’t be a problem. Cameron, your options are to take chicken, buy meat in Maun and cook it before you go south or buy meet at Engilton Investments Butchery in Rakops. Some people say they bought the best meat there than anywhere in Botswana. Thanks for this useful information. Could you perhaps advise us of what products may not be taken across the border from SA to Botswana? I have tried a few avenues without getting any clear response. How can we comply with regulations if we cannot establish what those regulations are? Besides meat, I have had salads and vegetables confiscated at the border. Any clarification on this issue would be much appreciated. I have the same question as Trevor….Could you perhaps advise us of what products may not be taken across the border from SA to Botswana? I have tried a few avenues without getting any clear response. PLEASE advise if anybody can send me a list of this – we are travelling from SA to Moremi, going through Maun, but would really like to take our own cuts of meat from SA. Nicky, I asked on the Tracks4Africa forum and the feedback that I got is as follows: One is still not allowed to take certain fruit and vegetables into Botswana. Fruit: No citrus fruits, no mangoes, water melon, tomatoes, guavas, cashew nuts, papayas, peppers, bananas, marula or wild monkey orange. Vegetables: No cucumbers, baby marrows, patty pans, squashes, pumpkins or butternuts. You can call the Chief Plant Protection Officer on (+267) 392 8745 or (+267) 392 8786 for more information. At the moment there are no restrictions on bringing red meat in from South Africa. However, best is to just shop in Botswana as the meat is good and half the price of SA and you will support the local economy! Beef Boys in Maun is renowned for excellent meat. Thanks so much for all the info Karin – appreciate ! Heine, when there is an outbreak of Avian flu (also known as bird flu), like we have had in South Africa under ostriches in recent times, these vet fences also serve as a means to prevent the spread of the flu. During such an outbreak you are not allowed to take chicken into neighboring countries.